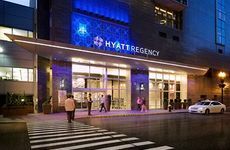 Find Hyatt Regency Boston deals, discounts and special offers. Featuring 500 guestrooms w/sitting areas & city views, this hotel also offers a pool, a gym, and a spa. This historic downtown Langham offers jazz brunch, 318 smoke-free rooms, & fitness center. A landmark Boston Harbor waterfront hotel in historic Rowes Wharf, Boston Harbor has 230 rooms on the 8-16th floors. 60 rooms, in high-end boutique 15 Beacon, with gas fireplace and queen poster beds; free sedan service. The Back Bay location offers the Stanhope Grille, Cuffs Bar & the charm of being housed in a historic police station. A luxury-class boutique hotel at the heart of downtown Boston, and home of the popular KO Prime restaurant. 193 newly renovated rooms with dramatic views, the Ritz-Carlton, next to Sports Club/LA, has art collection & ballrooms. The 1912 Fairmont, with special Gold floor, has Renaissance decor, & Catie Copley, a black lab, available as companion. An airport hotel with free shuttles, the Hyatt has a business center, fitness center, & harborside grill & patio. 214 room boutique hotel in Copley Square (Back Bay), the Lenox has old-world decor, dining & hybrid car service. Connected by skybridge to the Convention Center, the 803-room Westin has 29 meeting rooms, & restaurants. Newly renovated Milennium, right at Faneuil Hall, has stylish decor, new dining room & lobby, & internet. The Back Bay-Copley Square Colonnade has a roof-top pool, 285 rooms with floor-ceiling windows that open. 79-suites boutique hotel, home to Clio Restaurant & a sashimi Bar, the European-style Eliot is in Back Bay.